A curious fly. Do you know the history? Do you fish the pattern? Or fan wings at all? It's so goid to see a dry from you. Thanks. Thanks Dale. The Pink Lady was developed by George LaBranche around 1910. The Fan Wing version is illustrated in Bergan's "Just Fishing", 1932. I regularly fish fan wings for smallmouths. A Heavier tippet (usually 2x) is necessary in order to keep the tippet from twisting. The smallies really eat up a blue damsel fan wing I tie. Cool. Thanks for the info. What size hooks do you tie the damsel on? Are these small smallies? Maybe we're alike: I may not catch many but at least they're all small. Or in your case, all smallies. I tie 'em on size 10 Mustad 94840; and yes, they are usually pretty wee smallies! Good fun on a cane 5 weight just the same! Indeed. Today I caught a few small cutts on a 4-weight cane rod, size 12 Ausable Wulff. No smallies here, but loads of wild trout! As far as I can tell they all eat dries. Haha. GORGEOUS 'fan wing'....and and and PINK !! !...I love pink !!! pink reminds me time and time again to the sooooooooo many sweet lips I kissed in my 'youth' hahahahaha (but don't tell that to my 'dearest enemy of my heart DALE...he is not to trust that fellow...and besides he dislikes (thus hates) pink !!! yes he does !!! PS...Alec...'my enemy of my heart' can't know everything ...at least this is something good about him...and in a good 'day' he wants still to learn something...but not allways (only when he is in a good day and mood - psttttttttt and no it is not his 'former blonde' who told me that hahahahahaahha..........ah ah ah I love pink !!! As always great conversation on this site...educational as well. 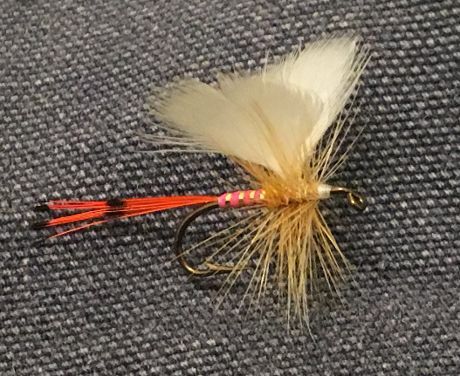 Beautiful flies as always Geert! Thank you my friend. That's one gorgeous fanwing, Alec! I'd seen it tied as a wet, but never as a dry!